When my oldest daughter got engaged on Christmas Eve four years ago, my husband and I put $5,000 into a checking account for her wedding. We gave her the checkbook and wished it were more, but with 6 kids in the family; it was all we could do. Rather than being disappointed, she made it a challenge to only spend $3,000 and be able to save the rest! We talked about some ideas over Christmas break and by the time her classes started at the University for her last semester of college, we had some plans. I’m going to share with you some tips we found that helped us make her wedding and reception truly special while staying within our budget. My daughter and I discussed what was most important to her. 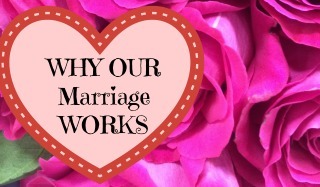 I advised her to think about what she has always hoped for and dreamed of in a wedding. Were the flowers what she thought of? The dress? The cake, or maybe the meal? 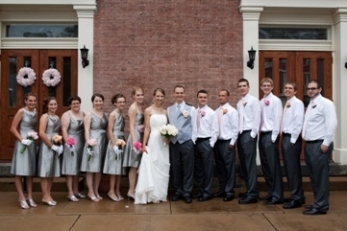 Decide what you have to have, make a list and rate the importance of each aspect of the wedding and reception. Figure out the few things that you don’t want to compromise on and the things you are willing to be flexible on. Julianna (my daughter) wanted an elegant, retro look, but didn’t care how we did it. She decided her bridal bouquet was one thing she wanted to be perfect. We ordered a garden rose hand tied bouquet from a florist and extra roses for me to make the bridesmaids bouquets, groomsmen boutonnieres and all the corsages and floral arrangements. We searched high and low for bridesmaid dresses that had the look Julianna was going for, but only found what she like from a custom dress company, Aria Dress. Julianna felt that she would rather help pay for her bridesmaid dresses and scrimp elsewhere. She picked the fabric (a gray raw silk) and length (knee length) and gave the girls their choice of neckline and skirt shape. The dresses were custom made to each girl’s measurements, and we paid for part of each dress. Julianna decided she didn’t want to spend more than $300 on her dress. We went to David’s Bridal in Philadelphia on the day the Vera Wang line was launched. The girl who was assigned to us actually rolled her eyes when she heard our budget! I seriously did not think it was going to be possible to find a dress at that price, especially at a big name, big city bridal shop! Julianna wanted a dress with lace on the outside, so I pulled one off the rack and it turned out to be her dream dress! It was a $1500 dress on sale for $299! perfect, right? Well, there was a little problem. The dress was a size 12, and Julianna was a size 4! The kind lady in alterations assured us she could make the dress fit for only $350 more! This is where you get creative folks! We heard of a lady who altered dresses for a good price, she was called and came to the store. 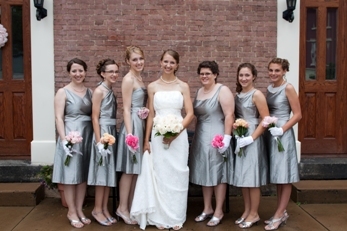 She altered the dress for under $100, and the future mother-in-law graciously paid for it! 3. Let your family and friends help! I used to have my own home catering business, but my daughter would not allow me to do the food. She wanted me to just be her mother on the wedding day! My close friend who used to help me cater offered to make the reception meal as her gift to the new couple. We agreed with thankful hearts! We gave my friend an envelope with $1,000 in it and she made a wonderful wedding meal of lasagna, salad and green beans amandine along with appetizers, a coffee bar and other cold drinks. Julianna’s fiancée loved pies, so we asked some of our friends and family if they would make a pie or two for the reception. They had a small cake for cutting, but the dessert for the guests was homemade pie and ice cream. Can you have a reception at your work place or church for free or cheap? That is one way you can save a lot of money! We had the reception at the private school my children attended. They have a large room with old wood floors that is perfect for a large gathering. We were able to use the room and large commercial kitchen for a donation of any amount to the school. They had tables and chairs for our use, too. If there are things you want for decorating, ask friends and family before you go out and spend money on something you may only use once! Julianna wanted lots of white lights everywhere, so we asked for friends and family to let us borrow theirs. We made sure to label each family’s lights and boxes to avoid getting them mixed up and it worked great! People love to feel needed and helping set up, tear down or serve at your wedding will fill this need. Most people are happy to donate their time, but even if you pay them a little, it is cheaper than hiring people. We had our friend pay her teen helpers for working at the reception, but my friend refused to let us pay her anything. She actually gave us money back that my daughter and her new husband used on their honeymoon! I went to antique stores and thrift shops once a week and bought retro coffee mugs for the wedding favors. I spent no more than 25 cents per mug! It took me a long time to get 200! I printed off “business cards” for free at Vista Print and made them cards to attach to each coffee mug as a thank you. I picked a design that went with the wedding colors and added my own verse and thank you from the couple. I used a hole punch and tied each card to a mug with ribbon in the wedding colors. We used a friend who was just starting his photography business for photos, he did a great job and we saved a lot of money on photography! 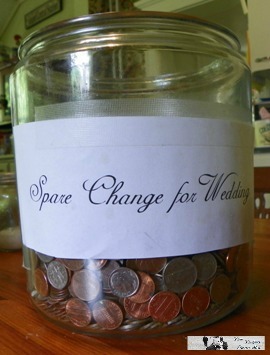 We started a “Wedding Fun” jar and tossed our change in the jar over the months of preparation. We then cashed in $80 extra dollars for extra expenses. 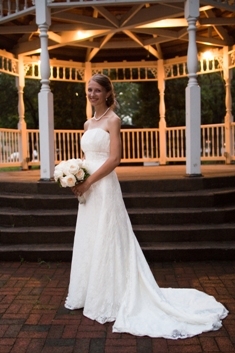 I hope you enjoyed reading about some of the ways we saved to make a beautiful and elegant wedding for our daughter. We had fun, worked hard and the end result was perfect! 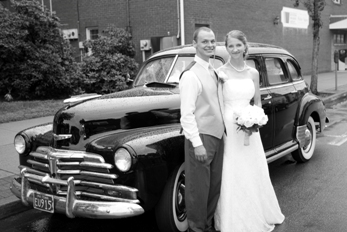 Thanks to Pamela Jablonski for sharing these wedding planning tips! 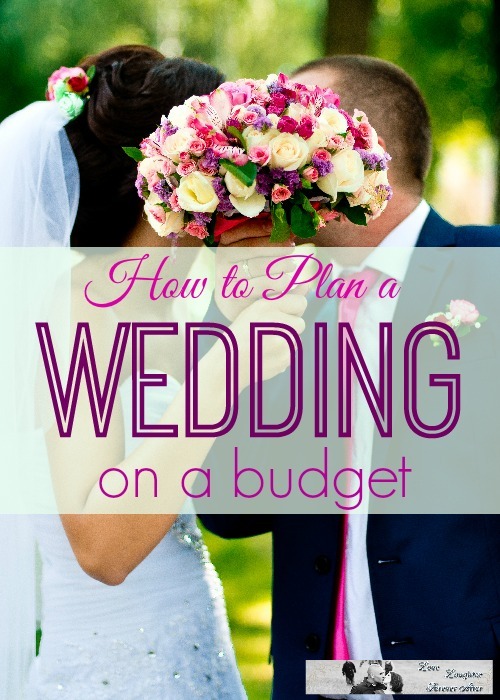 You too can Plan a Wedding on a Budget, get our ebook Rings On A Shoestring: Planning A Wedding On A Budget and get this Free Printable Wedding Checklist. Need to make a Maid of Honor Speech? I have some awesome tips for you. Weddings are unnecessarily expensive! I found myself nodding along as I read this because I did a lot of the same things. A couple themes when it came to saving money on my wedding were making what I could (veil, flowers, decorations, etc) and borrowing things (pew bows, crinoline, other decorations, etc). Doing a little research and price shopping for things that need to be bought can go a very long way! Amazing tips! I’m brazilian and I will need to do some things diferentes but this really helps!